Do you love lentils as I do? I only discovered them about 15 years ago, after I first moved to London. Needless to say, I cannot get enough of them since then! Not surprisingly, all my three kids were introduced to lentils as soon as they started solids. Now that they are 13, 10 and 4, lentils are definitely one of the staples in our kitchen. We use lentils to make chunky soups and spicy dahl, blend them into purees and dips and use them in salads. 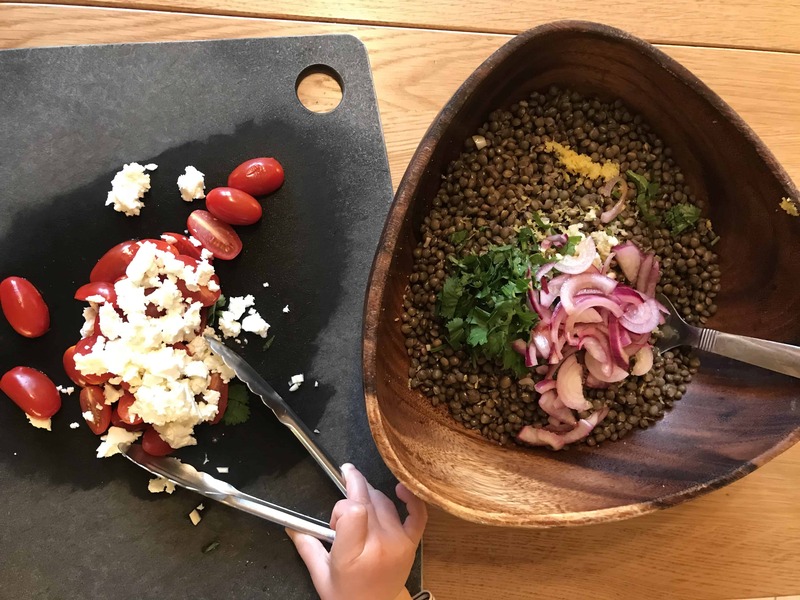 The kid-friendly iron-rich lentil salad I am sharing with you today is one of my family’s recent favorites, so I really hope you like it too! 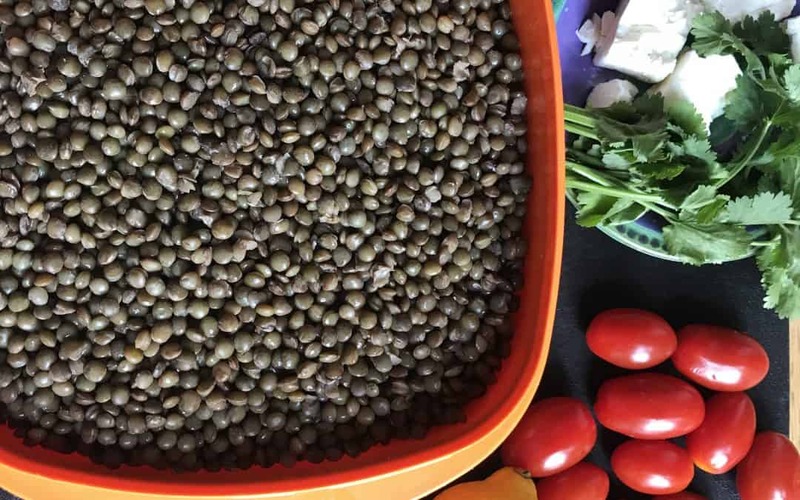 The French or puy lentils I am using in this recipe are very easy to prepare, they typically take about only 20 minutes to cook, and require no soaking. And you can buy them already prepared, in cans or pouches. The salad can be deconstructed very easily, making it a perfect dish for smaller kids for those who are wary of mixed dishes. Just mix the dressing into the lentils (or serve it alongside) and serve the rest of the ingredients in a bowl, or on a chopping board, to minimize clean up. The onion in this recipe has been marinated in lemon juice just for a few minutes. This helps reduce the kick and add the crunch. I hope your kids like it this way! The salad is REALLY delicious, so the adults in your family will also leave the dinner table happy. Finally, the nutritional reason. Lentils are rich in protein, iron, and fiber, the important nutrients for kids and adults of all ages. If your kids are not used to eating salads, it may take some time for them to warm up to them. Here are my favorite tips to help you make this transition smooth. Always have one-two familiar options on the table. For example, if this lentil salad is your main dish, add some bread, cheese, yogurt, fruit or any other foods may enjoy, to round the meal. Feel free to serve more ingredients that your kids may want to add to their salads. Maybe they will like to add rice or pasta to their creations? Remember, it’s all about baby steps when it comes to helping kids eat more variety. Do not be disappointed if all your kids eat is a lick of feta cheese. In the end, every time you sit to eat together adds to the infinite number of exposures they need to learn to like it the new food. Cook the lentils according to the instructions. Cool until slightly warm to touch. If using cooked lentils, just rinse them before mixing with the dressing. In the meanwhile, place the sliced red onion into a small bowl and pour the lemon juice over it. Leave to marinade for 10-15 minutes. Add the lemon zest, olive oil, salt, and garlic to the onion and mix everything together. Pour the mixture over the lentils when they are still warm and mix together. The salad can be prepped to this point and kept in the refrigerator for 1 day. Make sure to bring it to room temperature before mixing in the rest of the ingredients and serving. Add the tomatoes, feta cheese and cilantro to the lentils, mix well and serve. Clever idea! As far as an accepted food is included, you are covered :). I love the deconstructed concept, too.